We are an industry inundated with technology. Technology can help dealerships operate more efficiently, extend the life of a customer, interact with new ones and market to previous ones. Just like any technology, however, you must use it for it to do its job. One feature that many dealership managers take for granted is the CRM. In particular, holding salespeople accountable for not only accurately accounting for their customer interactions but also gaining accurate information about them. Some sales desks will even track showroom traffic on a paper desk-log not even checking to see if the salesperson logged the customer in the CRM at all. This practice can harm your dealership operations in more ways than many realize and cost the dealership opportunities and/or sway decisions on marketing with bad data. Every salesperson will log a customer who they write up. Most of the time for the simple fact that the sales manager can then pull the customer up to save any numbers presented to them. What about that customer that the salesperson greeted on the lot, spoke to for awhile, perhaps even showed a couple cars to but didn’t get anywhere with and the customer left without giving the salesperson any information? Chances are 50/50 that the customer wouldn’t get logged for the simple fact that the salesperson didn’t get any information. Or let’s look at the more positive side, your dealership has a very busy showroom and salespeople are constantly with customers gaining a new one after they have finished with the previous. It’s not uncommon for salespeople to carry a notepad which they use to jot notes or even the back of their own business cards. Because they’re busy, those note and business cards pile up. At the end of the day, perhaps the salesperson goes through and inputs each customer into the CRM. Another possibility is that the salesperson cherry picks the customers that they either want to protect (as many dealers offer 72-hour protection to its salespeople) or those the salesperson feels is worth following up with. Anything less than 100% compliance with entering customers can easily sway decisions ranging from staffing, marketing spends, employee performance and many others. Dealerships that aren’t logging all of their customers in the CRM end up with an inaccurate view of their entire sales operations. Busy dealerships appear not as busy as they really are and could prevent a dealer from realizing this. In this case, the dealership could be understaffed with customers either waiting a long time for assistance or not getting assisted at all. In busy dealerships, its hard for a sales manager to keep track of everything that is going on while desking deals and juggling all of the tasks that are assigned to them. Salespeople certainly don’t want MORE salespeople as that could bite into their personal incomes. But the bottom line is that if your dealership is understaffed, your customer’s experience at your dealership is probably not great and sales are walking out the door. And the sad part is that you’ll never know it. Why? Because all customers aren’t being logged in the CRM. Another example of how the failure of logging customers in the CRM can hurt a dealership is through marketing decisions. Most CRMs include a source as one of the pieces of information that salespeople are supposed to collect. “How did you hear about us?” is something that most dealerships ask. But how accurate is that information? If salespeople are entering the typical choices of “walk-in”, “billboard”, “drive-by” or “Auto mall” you’re missing out on valuable information that could be costing you thousands of dollars. Don’t think that’s happening at your dealership? Here’s an easy test. Go into your CRM and add a couple sources for programs that are well known but your dealership does not currently use. Wait out the month and run a source report. Chances are that you’ll find that all of a sudden these non-existent sources are producing sales. If your salespeople are not putting accurate information into the CRM, how do you expect to be able to use that information to allocate your marketing spend? This test will not only show you how bad the problem is but can also identify the biggest offenders. 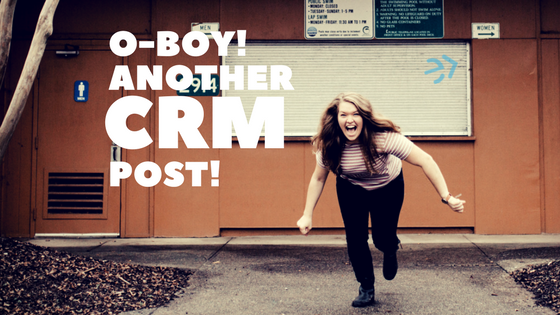 Just like the old saying, “Garbage in, Garbage out” your CRM is your dealership’s future. It can be the most wonderful tool to help you operate efficiently, follow up relevantly, catch previous customers coming back into the market, ensure an excellent customer experience by visiting prospects and assist you in spending your marketing dollars more effectively. It can’t do that, however, if the information isn’t accurate or non-existent. Make enforcing the logging of customer information a priority in your dealership and you’ll find that all of a sudden the blinds are drawn, the sun comes in and you can clearly see what’s going on. Originally published Jan 23, 2018 as a guest blog for Nextup.